God, I hope you're real! It absolutely is, and yeah! I hope to come some armor parties at some point, though that will probably have to wait until post-Graduation. OMG I HAVE FOUND ANOTHER WHO WILL UNDERSTAND MY RIDICULOUS REFERENCES (creepio is my fav). Looking forward to seeing more armor! Good luck on the graduation bit (and hopefully we can see you before then!). I'm headed back to school this fall for a Masters, so I understand the "struggle." Thanks! And that's a good point about the weathering. I'm planning to add some dents and scratches, and I think a good layer of dusty/muddy grime would be appropriate. I just want to make sure the colors stay nice and vibrant. NICE! I would love to have an armor party that's not 3+ hours away. About the weathering, on my vibrant kit (turquoise) doing weathering with black and brown washes added a lot of depth to the colors overall and I think my paint job really benefited from it. That being said, I've seen some real pretty clean kits, and a well done lightly weathered kit looks killer. Yeah, I'm hoping some light dirty weathering will help my colors pop! I just don't want it to get...too grimy, you feel? The cape would have some feathered trim (or maybe be covered in feathers? unsure) and be clasped in the front by a little golden or copper clasp. Either a mythosaur or a varactyl, depending on what I'm feeling. (I'm still not sure if I want to do a hood on the cape, but I'm not sure of most things with this kit, que sera sera.) 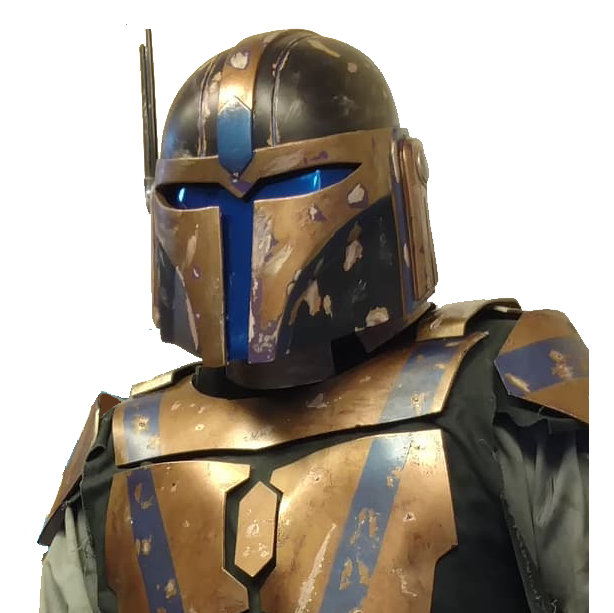 Also, on a related note to gold and copper, I've made some slight color changes in considering copper as my base metal color of my armor instead of steely grey. I think it could look pretty snazzy. I would accordingly change all my metallic accents to copper. The visor has been colored gold, since I think I'm gonna end up using a gold mirrored visor, and I've added a few more gold accents throughout - trim on some of the designs, gold highlights to the warm-colored feathers, etc. (When painting, I'll probably use a really shiny liquid gold kind of paint, just to make it really pop, you know? Maybe do that part in some super shiny acrylics or something like that.) Also, I'm considering making my girth belt the light orange color that pops up throughout the kit and using a warm brown leather for the ammo belt over top of it. I'm loving the nice warm tropical vibe that the kit's developing, and I hope to continue improving the design for the next few months until I can actually start building! As a side note, if I do the hooded cape, I plan to make the rangefinder collapsible/removable so I can still wear it when the hood's down. I still love it as an accent, especially with the feathers on it. And I still want to do a jetpack! I'm just not sure if I want a jetpack, a cape, or a simple backplate for my first run at this kit. What do you guys think? Let me know if you have suggestions/advice/general thoughts! I'd love to hear them! Ori'vor'e! Go for the copper color as your base metal. It's pretty unique. I like the cape idea, but if you do make it, just have feathers as the trim on it. Gotta say...I'm a fan of the bronze/copper look. The cape would be neat, but I caution you against the hood. 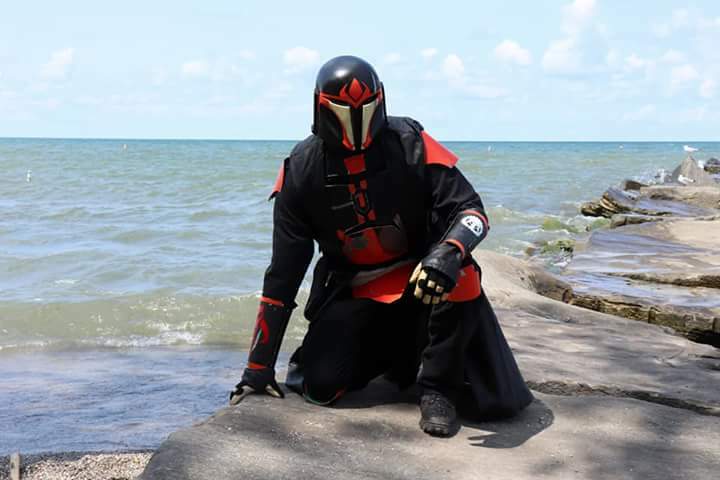 I first started with a hooded Mando until someone pointed out that functionally there's not much reason to wear a hood because you're already wearing a helmet. I agree the bronze/copper look would be wonderful here!